Three leading mental health charities have helped EastEnders to dramatise a debilitating mental illness affecting women after childbirth - Postpartum Psychosis - for one of the soap’s biggest storylines over Christmas and into the new year. Experts from APP (Action on Postpartum Psychosis), Bipolar UK and Mind, together with women who have themselves experienced this condition, advised the script writers over several months. They also met the actor Lacey Turner, whose character Stacey Branning becomes ill after giving birth on Christmas Eve, and her on-screen partner. APP, Bipolar UK and Mind welcome EastEnders raising awareness of Postpartum Psychosis and Bipolar Disorder through Stacey’s story, which will hopefully reduce stigma and encourage affected individuals to seek support. Postpartum Psychosis is an episode of severe mental illness that normally occurs shortly after giving birth and escalates rapidly. Around 1,400 cases occur each year in the UK i.e. one or two cases in every thousand deliveries. It often occurs without warning to women with no previous mental health problems. Symptoms include hallucinations; delusions; mania (elation), depression, or anxiety; and extreme confusion. Other symptoms can include being unusually talkative, racing thoughts, feeling very energetic, excessive irritability, agitation, and having trouble sleeping. It’s an emergency situation and women experiencing Postpartum Psychosis should receive specialist treatment in a Mother and Baby Unit. It is not a form of Postnatal Depression. Postpartum Psychosis differs from Postnatal Depression in terms of the symptoms experienced; severity; risk factors; treatments required; and illness course. With the right treatment and support, the vast majority of women make a full recovery. Whilst unwell, women need help to care for their baby, but most retain a strong bond and enjoy a thriving relationship with their infant. It is extremely rare for babies to be removed from women with Postpartum Psychosis. High risk women include those with bipolar disorder and schizoaffective disorder, who are at around 25% risk of developing the illness. Women who have previously experienced Postpartum Psychosis have a risk of around 50%. For these women referral to specialist perinatal mental health services before delivery is vital. Women whose mother or sister have experienced Postpartum Psychosis have a higher risk than the general population (around 3%), unless they have a history of severe mental illness themselves, in which case their risk may be in excess of 50%. It is not always possible to prevent this illness in high risk women, however medication during or straight after the pregnancy/ birth as well as support (such as help with night feeds, monitoring early symptoms) can help to minimise the risk. Women with a diagnosis of Bipolar Disorder who are thinking of starting a family should talk to their health professionals and request referral for specialist preconception advice. During this appointment, you will be able to discuss your current medication, your risk of postpartum psychosis and the care you can expect during pregnancy and following childbirth. Women who are considered high risk should always be assessed before leaving a labour ward. 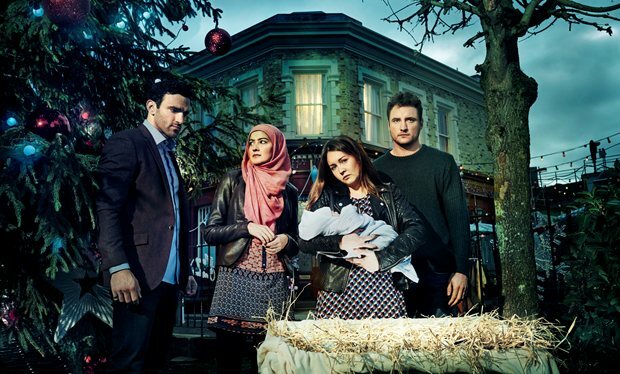 “We have been working with the EastEnders team to develop this storyline over several months and have been impressed by the dedication they have shown in portraying Postpartum Psychosis sensitively. We accompanied some of our supporters who have personal experience of Postpartum Psychosis to Albert Square to meet with the researchers, actors and writers, and we have been involved with ongoing script consultation where the researchers send us different versions of the script and we feedback with comments and suggestions. “One of the main aims of our input into this storyline is to ensure that we challenge the myths including the idea that women who have Postpartum Psychosis are always a danger to their children, that the illness is a form of postnatal depression and that women never recover. We have also advised the programme to adopt a realistic timetable to ensure that Stacey does not become unwell and then recover in the space of a week! “Mind’s media advice service works with soaps and dramas to inform storylines when a fictional character has a mental health problem. The main aim of the service is to tackle incorrect and outdated stereotypes. “Women with Bipolar are at a higher risk of becoming unwell during pregnancy or following childbirth and Postpartum Psychosis occurs after about 25% of births to women with Bipolar. Women with Bipolar are at an even greater risk if they, or their mother or sister, have already experienced postpartum illness. Women with Bipolar have more issues to think about when considering starting a family. With relevant information and careful planning, the majority of women take the decision to try for a baby and make excellent mothers. The causes of Postpartum Psychosis are still unclear. Studies have found that genetics can play a part. Hormones and disrupted sleep may also be involved, but more research is desperately needed. Almost a quarter of maternal deaths between six weeks and a year after birth are related to mental health problems, and one in seven deaths in that period is caused by suicide. A recent report suggested that around half of suicides by women while pregnant or after giving birth could be prevented by better standards of care. APP is a charity hosted by the University of Birmingham, set up to facilitate ground-breaking research into Postpartum Psychosis. APP provides information and a peer support network for women and their families, funded by The Big Lottery; the network is run by women who have themselves experienced Postpartum Psychosis. APP currently has over 700 network members with personal experience of Postpartum Psychosis and its Peer Support forum has almost 900 users. Since launching four years ago, the APP information website has received over 500,000 unique visitors and APP Information Guides have been downloaded over 5,000 times. There have been more than 10,000 visits to the Personal Stories webpage on APP site and APP videos made by women with experience of PP have been viewed over 26,000 times. APP information and support over Christmas/New Year: The APP office is now closed until 4 January 2016. APP’s Peer Support Forum (www.app-network.org/pptalk) is open 24/7 and is available to anyone personally affected by Postpartum Psychosis, including partners, friends and family members. The APP website (www.app-network.org) is a central resource for Postpartum Psychosis information, research and personal experiences. Insider Guides written by those with personal experience of Postpartum Psychosis and leading academic experts are available on: Recovery from Postpartum Psychosis; Support for Partner; Planning Pregnancy and Childbirth (www.app-network.org/what-is-pp/app-guides). Bipolar UK is the national charity dedicated to supporting individuals and families affected by the much misunderstood and devastating life-long illness of bipolar. We provide a range of services to enable people with bipolar to take control of their lives, including Information and Support, the eCommunity, Support Groups, Link Mentoring, Workplace Training and our Youth Service. We also work in partnership with research organisations to improve medical treatment and support, and we seek to combat the stigma and discrimination of bipolar. Bipolar is a severe, life-long illness characterised by significant mood swings from manic highs to suicidal depression. Both men and women of any age and any social and ethnic background can develop bipolar. It can be triggered when work, studies, family and emotional pressures are at their greatest. For women, it can also be triggered by childbirth or menopause. The World Health Organisation identifies bipolar as one of the top causes of lost years of life and health in 15 to 44 year olds. Bipolar Christmas opening hours: The Bipolar UK office will be closed from 25 December – 4 January 2016. Our eCommunity (www.bipolaruk.org/ecommunity) is open 24/7 and is a supportive online forum for everyone affected by bipolar. The eCommunity is a safe and secure environment to talk with others, provide and receive support and advice, and share experiences of bipolar. Emails can also be sent to info@bipolaruk.org. These will be monitored by our Information and Support team over the Christmas period. The Bipolar UK website provides lots of information and advice about bipolar, with a range of leaflets available to read and download. Thursday 24 December (Christmas Eve) - 9am to 4pm, Friday 25 December (Christmas Day to Monday 28 December- closed, Tuesday 29 December - 9am to 6pm, Wednesday 30 December - 9am to 6pm, Thursday 31 December - 9am to 4pm, Friday 1 January - closed, From Monday 4 January - usual opening hours.